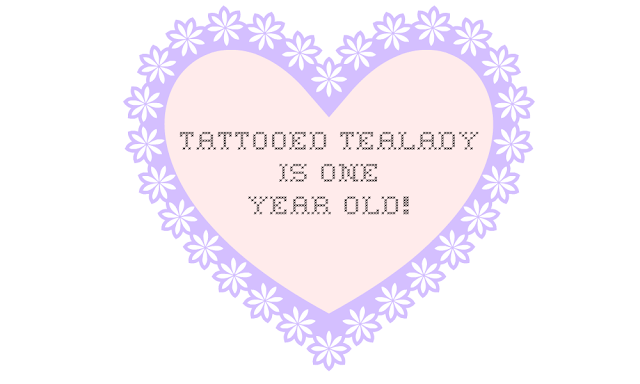 Today is a pretty special day for Tattooed Tealady. Today marks the one year blogiversary (oh I love how cheesy that sounds!) of my blog! How shall we celebrate? Tea and cake? Or something a little stronger? When I first started this blog, I never imagined that I would put so much of myself in to it, that I would spend so much time on it nor that it would have come so far. My blog is a huge part of me and has become a huge part of my life. I'm very proud of my little space here, and so I couldn't let it's one year birthday pass me by without saying something. It's been quite a journey over the past year. I still get the same nerves I did when I made my very first post, and the excited feeling whenever someone comments on a post I've spent a lot of time and effort putting together. I've adored chatting to people in the comments, on Twitter and ultimately, making friends I treasure and adore. I've met some amazing girls (and a couple of pretty fantastic men too) and I've made some unforgettable memories. This blog has brought a huge amount of happiness in to my life, and given me passion and drive for blogging in a way it never has before. So if you've ever stopped by for a little read, said hello or even found this blog to be a little bit of help in your latest quest for the perfect beauty product, thank you. As much as I write this blog for me and my love of beauty, it is there for my very lovely readers to enjoy. So thank you to each and everyone of you who does! Happy birthday tattooed tea lady you scrumptious little blog! Congrats on one year!!! Hopefully there'll be many more bloggerversaries to come! I'm a one of your followers and would love if you could take a look a look at my blog and give me your thoughts? You're blog is fantastic, seems you've achieved a lot of things in such a short space of time! I wish you many more happy years of blogging! Congratulations - I've read your blog pretty much since it started and always love to read what you've got to say. Well done :) and Happy Birthday! HAPPY BIRTHDAY TO YOUR BLOG!!! VERY happy for you :D I am a new subscriber but you touched my heart on twitter today so I had to visit! <3 I shall be back my dear. A very Happy Birthday you're such an acomplished blogger for only being one year old!